Linda Kovic-Skow is a best-selling author in travel in France. Originally from Seattle, she currently winters in Gilbert, Arizona and spends summers on a boat in the San Juan Islands. She earned an Associate Degree in Medical Assisting in 1978 from North Seattle Community College and a Bachelor of Arts in Business Administration from Seattle University in 1985. She has been married for 29 years, has two daughters and a Shetland sheepdog, named Abby. An enthusiastic traveler, Linda also enjoys hiking, boating, gardening and socializing with friends. "French Illusions: My Story as an American Au Pair in the Loire Valley," is her debut memoir and the culmination of a three-year project. The sequel, "French Illusions: From Tours to Paris," will be available fall of 2014. 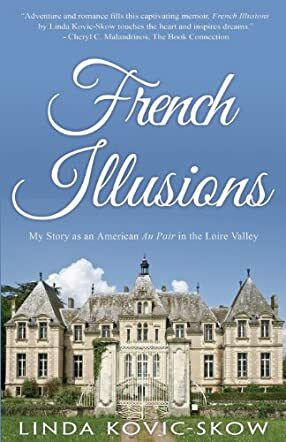 French Illusions - My Story as an American Au Pair in the Loire Valley (Book 1) by Linda Kovic-Skow is the author's true story which makes for a very interesting read. Linda Kovic-Skow wants to become an international stewardess and she needs to be bilingual for that. Linda decides to become an au pair in France to become more familiar with the language. Linda goes to work at the Chateau de Montclair with Monsieur Dubois and his family. Her life takes a turn when she meets Adam, a young student. It becomes more complicated and in this story she takes readers along with her on her adventures. The book is an honest account of the author's life and her dreams to travel the world. The book is insightful and it captures the beauty of the Loire Valley. There are also some French words scattered here and there throughout the story. The story is about how Linda tries to adjust to the family and the difficulties she faces. The clash of personalities, the conflict, and the tension is another aspect in the author's life at the Chateau which she has captured very well. The Loire Valley is the backdrop of the story. I liked the development of the characters; the author's writing is descriptive and elevates the scenic beauty of the place. It is a fast paced story that will keep readers interested till the very end. This book was excellent! I have never had too much of an interest in France but Linda's beautiful descriptions inspired me to want to travel there someday. The story is great on its own and the way she tells it makes it even better.There are few books that can make one laugh, cry, and cheer for the main character but this is one of them! I loved the pace of this book, as well as the diverse characters that we are introduced to. The descriptions are detailed and beautiful, and I find myself drawn to the warm, well-intentioned protagonist. Plus, the fact that it's a true story makes it all the more exciting!! This was a fun read any Francophile would enjoy. What an amazing true story. It just makes me want to drop everything and hope on a plane to France, or better yet a time machine. I just heard that there is going to be a sequel and I can't wait! Unique, Fun, Sinister and True. Not my usual genre but this came recommended by a friend. I found it to be a well written, fast-paced book enhanced by sprinkles of French, beginning with ominous overtones. The characters are finely drawn, multi-layered and believable. Humorous scenes are masterfully mixed with sinister episodes. I loved the twisted plotting, fresh writing and lovely descriptions. As the story deepened, I cheered the protagonist's personal successes. I read the book in one day – I had to know what happened. I was sorry to have it end, and am hoping Ms. Kovic-Scow's next novel will be coming soon! I loved the authenticity of the French descriptions; I have been to France a couple of times and appreciated the attention to details. The style, however, was problematic for me. I realize how hard it must be to recreate dialogue, but I got tired of hearing how she "brushed her hair til it shone" or "put on a (blue, burgundy) shirt and favourite black jeans" (no skirts? at all? in France? )or "ordered my usual...". I also wondered how she paid for her return ticket to the USA, why there was no mention of money from the au paire job and why she didn't look for a bit of part time work.Yet having said all this, I read both books within four days!